Astronomy software has never been so easy to use, in no time at all you'll locate, identify and learn about thousands of celestial objects in your night skies. An intuitive and clutter free graphical interface has you up and going in minutes with a full-screen planetarium, precision deep sky charts, telescope control, observation planning and many more features. STAR Atlas:PRO™ includes many features like the powerful search capabilities that allow you to find, identify and learn about celestial objects, an inbuilt observation planner assists you in planning which objects you want to see, a superb interface to the on-line Digitized Sky Survey images for downloading celestial images and a host of other features that save you time and keep you organised under the stars. Spectacular charting graphics with dozens of optional settings allow you to customise the way your charts appear. Choose colour schemes to suit indoors or outdoors and chart printing or create your own chart colour combinations. Display true star colours, selectable star sizes, eyepiece and camera field of views, add text to charts and more. Get ready to observe a lot of deep sky objects in no time at all! A sophisticated telescope control system for robotic telescopes provides superior and easy to use telescope control capabilities for Meade, Celestron and dozens of other popular telescopes. Dobsonian and other telescopes equipped with digital setting circles (DSC) or the Argo Navis are also supported. Click anywhere in the sky, sit back, and watch a digital image appear on your screen for the area of the sky or celestial object you selected. Store the image into STAR Atlas:PRO™ where it can be charted like other celestial objects and re-display the image with a click. This is a great way to see what celestial objects look like before deciding to observe or image them. A truly amazing tool ! 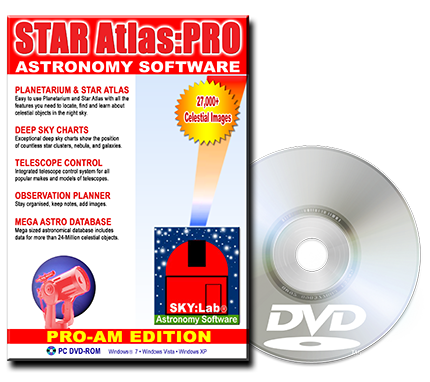 STAR Atlas:PRO™ is packed with more than 2.8 Gigabytes of astrophysical data. Astronomical databases include Abell Galaxy Clusters, Arp Peculiar Galaxies, Barnard's Dark Objects, Caldwell Catalogue, Milky Way Globular Star Clusters, Hickson Compact Galaxy Groups, Lynd's Bright and Dark nebulae, PGC Galaxy catalogue, Messier objects, NGC and IC catalogue, Quasars, Active Galaxies, Star Clusters, Strasbourg-ESO Planetary Nebulae, Supernovae Remnants and many many more! STAR Atlas:PRO's integrated Observation Planner collates and plans your observations in advance, saving precious time and keeping you organized, when it comes to observing or photography under the night sky. You can easily create your own list of celestial objects that you would like to observe and when you are ready to observe, the Observation Planner lists and charts which of your "target" objects are currently visible in the night sky. Argo Navis users can download target objects from the observation planner. Popular celestial objects like the Andromeda Galaxy, the Great Nebula in Orion, the Black-eye Galaxy, the Helix Nebula, the Ring Nebula, and Messier objects along with thousands more are all now at your fingertips. STAR Atlas:PRO™ supports many different telescopes.